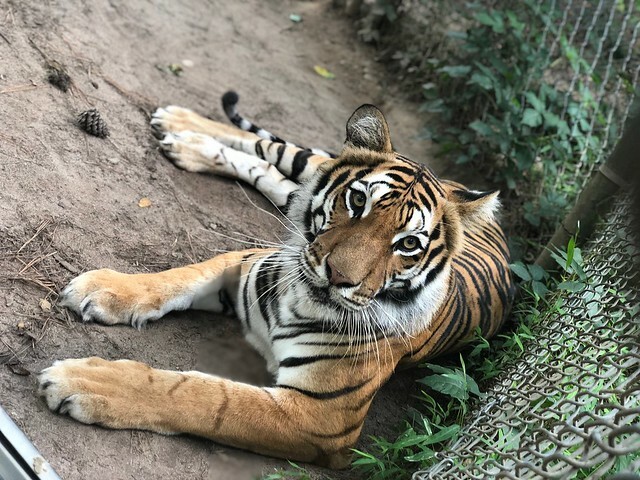 As a frequent visitor of Carolina Tiger Rescue who has become an adoptive parent and enjoys teaching others about the animals here, I understand the organization’s mission first-hand. After one visit, it’s clear how Carolina Tiger Rescue helps captive wild cats. What may not be as transparent is how the rescue also helps those in the wild. Through Carolina Tiger Rescue, I learned about another non-profit organization founded by Zoe Jewell and Sky Alibhai known as WildTrack, whose mission is to improve the monitoring of endangered species to help relieve human-wildlife conflict and counter-poaching. What does one have to do with the other? The animals, specifically the tigers, are the common thread. 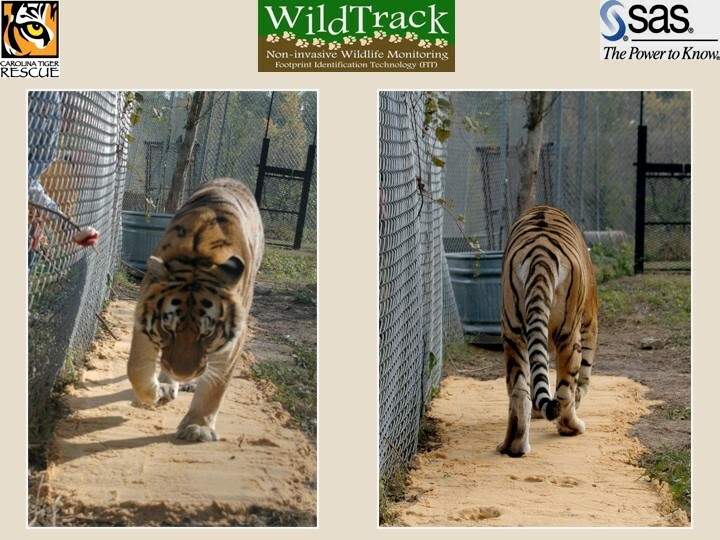 To collect the prints, WildTrack works with Carolina Tiger Rescue keepers to ensure safety for the animals and the people involved. The keepers select the animal most receptive to the process, often tigers who don’t mind people or who are more food-motivated. The tiger is lured into a separate part of their enclosure, which is then temporarily locked off. 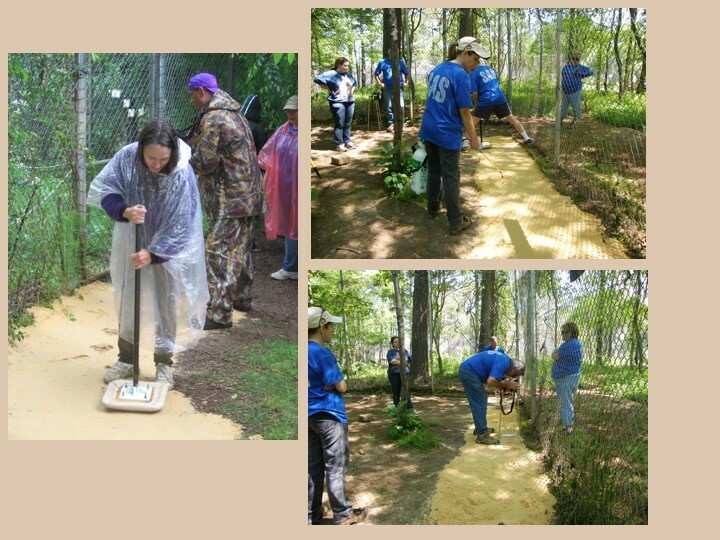 With the tiger safely secured, WildTrack volunteers flatten buckets of sand along one side of the enclosure they have safe access to. Want to help us celebrate International Tiger Day? Limit your use of palm oil. Palm oil farms result in major habitat loss for wild tigers. If we lower the demand, we can help make an impact! As the tiger walks, he or she leaves behind a set of tracks. Once complete, the tigers are shifted so the WildTrack team can evaluate the footprints, looking for good impressions of the left hind foot. The team places a ruler and ID tag near the print and takes a photograph. They typically repeat this process two or three times. Then, they load the photos gathered, each marked with 25 points based on the unique foot anatomy of the tiger. The FIT software analyzes the data to produce effective classification. A large library of prints is necessary to ensure accuracy. Every month, the WildTrack team and their volunteers visit Carolina Tiger Rescue to collect data from one of the resident tigers. Why do we need to monitor wildlife in the first place? The fragmentation, or breaking up, and destruction of habitat is a primary cause for the decline of wildlife populations in many regions of the world. Due to development or the removal of resources, critical habitat is often unwittingly harmed. By monitoring wildlife, scientists can determine the population, denning, feeding, wintering or travel areas for many species. By monitoring habitats in threatened regions through systematically searching for and recording animal tracks, evidence is obtained to make informed decisions about wildlife habitat stewardship. Once I learned about the work of WildTrack, I became a volunteer. I get to accompany the team when they collect foot prints and learn the software to tag the photographs that build the database. Plus, I get to share what I have learned with fellow tiger enthusiasts who visit Carolina Tiger Rescue. This is just one example of how Carolina Tiger Rescue is saving and protecting cats in captivity and in the wild. They work with other research scientists too!